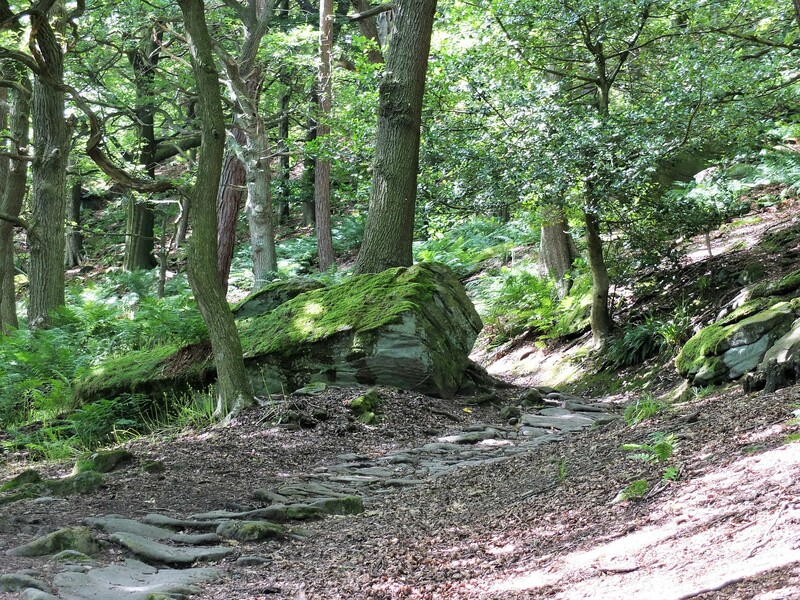 It is a rare thing indeed for us to purposefully visit Hardcastle Crags in summer. Almost as rare (apart from holidays), we set off at 1 p.m. on a mid-July Sunday to catch Gibson Mill’s opening hours. We took the most direct route via Hangingroyd Lane and the riverside path. New rock art stood in the centre of Hebden Water, where the banks were adorned with green and white flourishes. At the bottom of the steps up to Midgehole Road, loud barking caused me to jump out of my skin. A large dog leapt up from behind tall grasses. Phil let out an involuntary shout. Two women appeared, along with a smaller dog causing more commotion. The women apologised, saying it was a rescue dog responding to our fear. That sounded reasonable, except I hadn’t even seen the mutt, so how could I be fearful in advance? Later, Phil felt sorry for shouting at a rescue dog but I said (not for the first time) that dog owners should control their charges when they are likely to come into contact with other walkers. On Midgehole Road, signs declared the Crags car park full. We weaved between parked cars and clumps of irritatingly slow people to the main gate. Staying on the top track, we walked speedily to Gibson Mill. We immediately entered the building and climbed to the top floor to be met by the sight of a Victorian-era kitchen. An iron range arrayed with a selection of contemporaneous cooking vessels stood against the back wall. To the right, a shallow Belfast sink perched on brick legs. Around the cracked windowsill, peeling whitewash revealed fading yellow paint. Through a door on the left we found a larger room with tungsten bulbs suspended from a high ceiling. The ample space was occupied by Yan Wang-Preston’s ‘Forest’ exhibition, the main object of our visit. I had expected arty photos of trees. It turned out to be a project documenting the uprooting of mature trees in China and transplanting them to concrete cities where of course they die. Utter madness! Why can’t they grow new trees? Downstairs, we made our way to the café for freshly-made sandwiches and tea. We chose a table on the terrace and got a different view of the mill pond. From the upper floor, I had noticed small splashes hitting the water’s surface. What had looked like raindrops, I now realised, were being made by small fish. After eating, we went out front to finish our drinks. On the surrounding tables, yet more barking dogs threatened to cause alarm but thankfully, they were kept at bay. I spotted an acquaintance sitting nearby with a friend. We exchanged greetings before they entered the mill to peruse the exhibition. We took the slower, but less populous and pleasanter riverside route back to the main entrance. Tall pines stretched into the summer sky, the canopy giving respite from the muggy afternoon heat. Impossibly large stones punctuated the paths and stream, some sporting strange holes. Foliage made attractive greyscale patterns on eroding surfaces. At the almost-dry weir, dippers dived among square paving rendered visible by the low water level. As we rested on a nearby bench, I heard something drop to the ground. At first, we could see nothing. Then Phil realised it was his phone. The screen had cracked (For the third time. Luckily, he has since discovered he can buy the parts to fix it himself). On reaching the end of the crags, we continued on the riverside as much as possible, staying on the left-hand side towards town, foraging a few raspberries from sporadic bushes. We paused briefly on Victoria Road where a tractor seemed imprisoned. Headlights gleamed wide-eyed behind an iron gate fastened with rusty iron chains. Polished blue paintwork reflected blue sky. Getting ready for the local show, no doubt. This entry was posted in heritage, landscape, photography, walking, woods and tagged art, arts festival, Belfast sink, cafe, Calder Valley, Calderdale, canopy, car park, chains, China, dipper, dog, dogs, England, exhibition, family, fish, flowers, food, footpath, forest, gate, Gibson Mill, grass, Hardcastle Crags, Hebden Bridge, Hebden Water, heritage, iron, July, lunch, managed woodland, Midgehole Road, mill pond, National Trust, nature, path, photography, pines, range, raspberries, recreation, reflections, ripples, rocks, rust, sky, stream, summer, sun, sundog, tractor, tungsten, Victoria Road, Victorian, walking, weekend, weir, whitewash, windowsill, woodland, woods, Yan Wang-Preston, Yorkshire on July 24, 2018 by Hepdene Rose. Another sunny Sunday and I felt strong enough to tackle a longer walk. We intended to get the bus to Blackshaw Head and walk down Jumble Hole. I checked bus times as there had been some timetable changes but the website displayed the original times. On the way to the bus stop, we bought pasties and pop then waited several minutes. The Widdop bus came first. I suggested catching it to Heptonstall and possibly take the lovely route down to Hardcastle Crags. Alighting in the village, Phil stood in a patch of sun and declared he was stopping there. I laughed. We walked up Towngate and turned right. Along Townfield, we paused often to appreciate the white tree blossom above us, golden meadows stretching before us and panoramic views of the valley below. Among scattered farm junk, a child’s toy perched atop an animal feed container made us chuckle. At a fork in the grassy path, I suggested taking the lower one down to Midgehole. 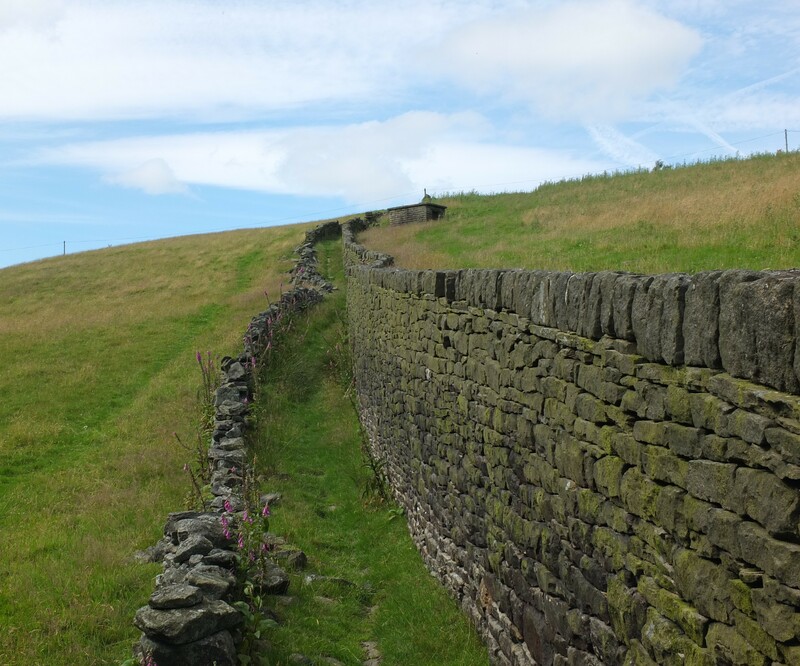 This took us along a stone wall, through a picturesque stile and onto Draper Lane. I could see the footpath sign across the road, slightly to the right. On the other side, we discovered a beautiful verge on the cliff-edge. We sat awhile on a convenient a bench surrounded by flowers to take in views of the Crags and Crimsworth Dean. An idyllic wooded path led downwards. Thin oaks stretch upwards, their bark adorned with red lichen and their tops crowned by shiny leaves. Tiny anemones poked out amidst bright green ferns. Gnarly roots acted as steps to aid our descent. I had expected to go more or less straight down to Midgehole but hadn’t factored in the steep cliff-like drop, hence the path travelled westwards as it descended, until it met with the bottom of Northwell Lane. We continued downwards along an old cobbled path where an old acquaintance was coming up the other way with a companion. She had availed herself of a strong pint of cider at The Blue Pig. On reaching the river, we decided we’d rather have pies than beer and walked along away from the pub to find a suitable patch of rocks to squat on. After eating, we continued on the riverside path and up to Midgehole Road. Having had a shorter walk than planned, we considered continuing up to Pecket Well but the prospect of a hot climb proved off-putting. Instead, we returned home along the tried and trusted route, where tiny May flowers lined the riverside and the beaches were busy with families enjoying the sunshine. This entry was posted in heritage, landscape, photography, walking, woods and tagged anemone, beach, blossom, bus, Calder Valley, Calderdale, cliffs, cobbles, Crimsworth dean, Draper Lane, England, family, flowers, footpath, grass, Hardcastle Crags, Hebden Bridge, Hebden Water, Heptonstall, landscape, May, meadow, Midgehole, Midgehole Road, nature, Northwell Lane, Oak trees, path, photography, recreation, river, riverside, rocks, spring, sun, The Blue Pig, Townfield, Towngate, trees, valley, verge, views, village, walking, weekend, wood anemones, woodland, woods, Yorkshire on May 23, 2018 by Hepdene Rose. Five days after the equinox, a hint of spring finally arrived! We set off aimlessly down the road, just eager to be out in the sunshine. At the corner, we watched a stupid man with a beard and shades manoeuvring his car dangerously until we could cross safely. Proceeding to Old Gate, we got splattered by a power washer. Further on, a kid called across the road to me: “I like your hair. I’m ginger too!” It crossed my mind to inform him that mine was dyed, but decided to be kind and just smiled instead. We could hear a brass band and turning onto Saint George bridge we saw the junior band playing on the patio of the Town Hall. A neighbour appeared with a woman waving a palm. We continued up Hangingroyd to Salem Fields. On the riverside, buds and flowers had popped out everywhere (and about time too, after the cold, harsh winter). Blooms of narcissi, anemone and the last of the snowdrops sprung from verges while catkins hung overhead. At the bowling hut we took an upward turn and admired a cascading stream behind. We started to clamber up an ‘animal path’. It proved rather dodgy. Returning to the track, we took a sharp left and walked upwards, where sycamore trees were being strangled by poison ivy, to cross the top of the stream. Hareshaw and Tinker Bank woods showed less signs of life, and Hollins as dank as ever. Approaching the garden gate for our familiar shortcut, we heard loud barking. A man on the other side controlled the dog – which turned out to be tiny and made us laugh. We kept to the top path, emerging on Moss Lane where the moon hovered in a blue sky. We went down Rose Grove and into town. After a couple of errands, we returned home a different way to avoid another splattering. I greeted a neighbour out gardening and said “Spring at last!” He responded by saying that it would be snowing again by Wednesday (it didn’t but did the following week). This entry was posted in landscape, photography, walking, woods and tagged anemone, brass band, Calder Valley, Calderdale, cascade, catkins, England, equinox, flowers, Hareshaw wood, Hebden Bridge, Hebden Water, Hollins, moon, Moss Lane, narcissus, nature, Oldgate, path, photography, river, riverside, Rose Grove, Saint George's Bridge, snow, snowdrops, spring, stream, sun, Tinker Bank wood, Town Hall, track, trees, walking, waterfall, woods, Yorkshire on April 11, 2018 by Hepdene Rose. The first decent walk of 2018 began on a bright, frosty day. Setting off at 2 p.m., thaw had occurred as we headed through town towards the riverside path. However, on the unpaved Groove Road, ice on the ground proved tricky. Just before Foster Mill Bridge, we stopped to examine a dilapidated cart in front of a wood-fronted garage, surrounded by frosty leaves and grass. On the bridge, mossy walls appeared to have been sprinkled with icing sugar. A cheery man said “nice day for it” and advised me to take care as we crossed to Salem. We took the steps up to Hollins, surveying the lovely sycamore tree and sunlight on the hills opposite. Through the eternally dark hamlet and into Tinker Bank wood, a group of walkers asked directions into town. We paused to consider which path to take and initially elected for the lower one before Phil suddenly took a steep upward path. I said we had not been that way before but he was sure we had. It became horribly muddy in places and I was glad I had sensible boots on. Large stone blocks were strewn either side of the narrow path, suggesting that it had been a vehicle track, lined by walls at one time. At the top, we emerged onto Lee Wood Road and were amused by the ‘slow’ sign nailed to a tree, beside a newly-formed waterfall. We walked eastwards towards Bobby’s Lane. But on encountering a paved lane downwards, we decided it might be a quicker way down to the riverside. Not sure if it was a private drive, we discovered a dilapidated shed and another shortcut. This one looked decidedly dodgy though, so we kept to the tarmac, and round a large bend to emerge near the posh horse farm. A couple walking with a bonkers dog created amusement for a few minutes before becoming rather annoying. We overtook them, until we were forced to slow down by ice underfoot. I also wanted to take photos looking up to Pecket Well where sunlight on the hilltops created a contrast with the dark shadows below. Further down, ice on the path turned to water. I kept to the edges and trod carefully. Reaching the river, we spotted more frosty vegetation and a tree branch fallen in the weir. We took the usual route back along Hebden Water and stopped at the first ‘beach’ to rest. As we climbed back up to the path, Phil saw someone he knew in the garden opposite and we chatted over the gate before continuing back to town – this time sticking to Spring Grove; a much safer option. This entry was posted in heritage, landscape, photography, walking, woods and tagged 2018, beach, Bobby's Lane, cart, dog, England, farm, Foster Mill Bridge, frost, garage, garden, Groove Road, hamlet, Hebden Bridge, Hebden Water, hills, Hollins, ice, January, landscape, Lee Wood Road, moss, mud, nature, path, Pecket Well, photography, riverside, rocks, Salem, sign, Spring Grove, steps, sun, sycamore, Tinker Bank wood, track, trees, walking, waterfall, winter, Yorkshire on January 9, 2018 by Hepdene Rose. Mid July, the intermittent summer returned bringing a bright, sunny day but with a breeze making conditions bearable. Phil and I took the same walk. 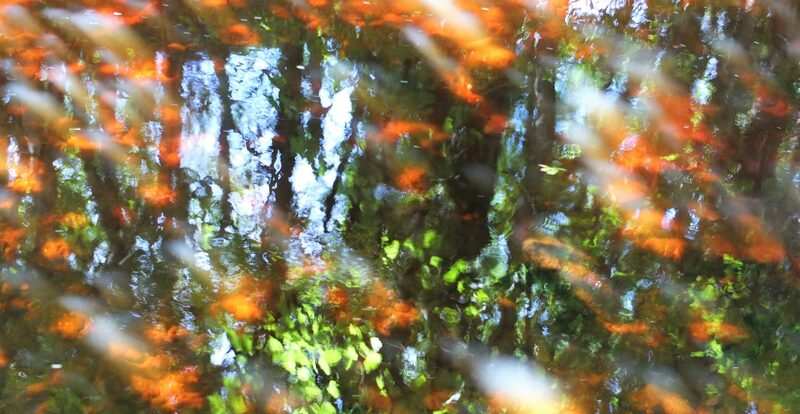 As we ambled along the river, we noticed the sun falling between the trees made arty reflections on the water’s surface. Our photos looked like impressionist masterpieces without the need for any digital trickery!. At Hardcastle Crags, we walked through the full car park, trying to locate the path I’d found instinctively in March but this time it eluded me. Confused, I asked a man in an NT hut. After he tried to flog me a map, I eventually garnered from him the way to the Willow Gate path. I just about recognised the leafy lane now overgrown with summer vegetation. At the field, I suggested a rest but the gate was not attached and required too much heft to lift so we perched on the wall. I pointed out a huge rabbit in the rough field opposite. Phil captured it on camera but I failed. As we climbed up the stone path, I indicated various rock features remembered from my previous visit. Continuing to the top of the wood, we crossed a stile and went up the ‘green lane’ to emerge at Shackleton. 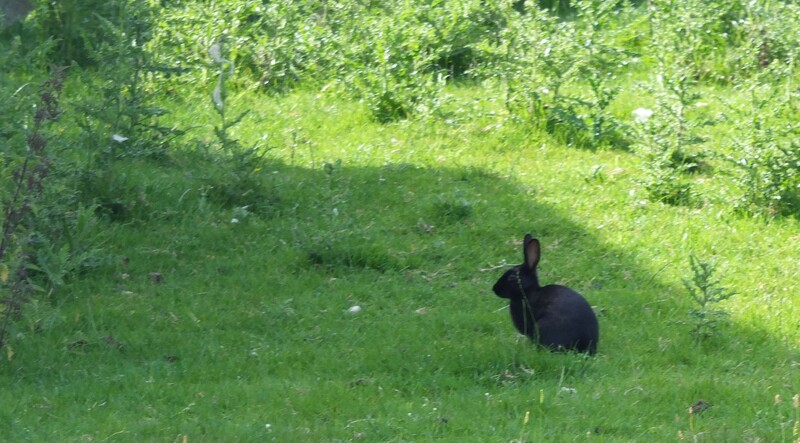 Spotting another rabbit, this time I managed to get it in shot. At the bottom of Shackleton Hill, we debated options. Phil said he needed to rest and I thought going into the dean might be too much for me anyway. We started down the track on the lookout for a stopping place, settling on a clump of rocks amidst the trees. We ate a small picnic before walking the short distance back to Midgehole Road. With 10 minutes till the 906 bus was due, we waited to enjoy a lovely quick ride back to town. As we walked home, the sky became cloudier and the air cooler. This entry was posted in heritage, landscape, photography, walking, woods and tagged 906 bus, Calder Valley, England, Hardcastle Crags, Hebden Bridge, Hebden Water, industrial heritgae, landscape, lane, Midgehole Road, National Trust, path, photography, rabbit, reflections, riverside, rocks, seasons, Shackleton, summer, sun, trees, valley, walking, Willow Gate, woods, Yorkshire on July 17, 2017 by Hepdene Rose. A Wednesday in June, the weather was not as good as forecast, but warm and sunny in places. Phil had been working at home and having been glued to the computer, late afternoon we eventually left the house. With no aim in mind we wandered up to the top of the road onto the buttress. As we climbed, I tried not to slip on the cobbles which never get the sun. At the top we sat briefly on the wall to catch our breath then continued along Heptonstall road thinking about going to Lee Wood. Instead, we headed down the next path which I thought might lead to Moss Lane but as we descended, I realised it would end up at Foster Mill Bridge. As we approached, we headed left to go through Hollins and into Hareshaw Wood. It became warmer and I stripped off a layer and rest on some large stones just off the path. We kept to the lower part of the wood and crossed the stream now totally dried up (odd as we’d had rain recently) and down to the ‘Swiss chalets’. Over the stone bridge, we walked along the river towards town, crossing back at the next bridge to the sunny side. Pausing for a bit of beachcombing, we spotted a bike and I said “You always find something on this beach!” (although it was obviously not detritus). Further on, we laughed at kids practicing with stilts on Salem Fields (Phil joked it had spoiled the surprise for what was in store during the ‘Handmade Parade’. This entry was posted in heritage, landscape, photography, walking, woods and tagged beach, beer, bridge, Calder Valley, cobbles, England, Foster Mill Bridge, handmade parade, Hareshaw wood, Hebden Bridge, Hebden Water, Heptonstall, Hollins, jackdaw, June, Lee Wood, Moss Lane, pub, river, Saint George's Square, Salem fields, Shoulder of Mutton, square, stilts, stones, stream, summer, sun, swiss chalets, The Buttress, Valley road, Yorkshire on June 15, 2017 by Hepdene Rose. Marisa and I set out on a sunny late March afternoon. We walked along the riverside where I noted the decaying tree stump (half the size as the last time I had seen it) and several new waterfalls. Climbing the recently-repaired steps to Midgehole Road we continued to Hardcastle Crags gate and through the upper car park to find the Willow Gate path. We stopped briefly in a lovely field scattered with interesting rocks and boulders, admiring the views. Continuing up along ancient causey stones, we noted letters carved into them. I spotted remains of mysterious wall and imagined the buildings that once stood here. Impressive rocks on our right resembled squares and pillars. We then came to the famed ‘Slurring Rock’. Marisa told me that people used to skate down it in their clogs. We carried on through Foul Scout Wood, across a makeshift bridge and a field containing ancient gateposts. At the hamlet of Shackleton, old barns held testament to a long history. Sheep alarmingly dyed red shared grazing space with pheasants. We proceeded downhill to the edge of Crimsworth Dean. From here we took the quicker way back, turning right onto the NT track, using new-looking steps to skirt the car parks and crossed the bridge to Midgehole. again taking the river path when possible. This entry was posted in heritage, landscape, photography, walking, woods and tagged causey stones, Crimsworth dean, England, field, flowers, gatepost, Hardcastle Crags, Hebden Water, landscape, markings, Midgehole, pheasants, photography, rocks, seasons, Shackleton, sheep, Slurring Rock, spring, sun, The Blue Pig, trees, Willow Gate on April 10, 2017 by Hepdene Rose.